Knowledge is power – especially when it comes to digitization. Therefore the etventure Learning Hub regularly presents methods, tools and know-how around digitization and innovation with the blog series #DIGITALLEARNING. Today we are talking about the business model canvas. In our last blog post we presented various digital business models. With the business model canvas we would like to present a tool with which business ideas can be ideally sketched and refined step by step. Startups in particular use this approach to quickly find out whether their business model makes sense from an entrepreneurial perspective. However, the business models of established companies are also constantly developing, new markets are being opened up and new sales opportunities are being exploited. It therefore makes sense to break up and restructure the business model for analysis and better understanding. 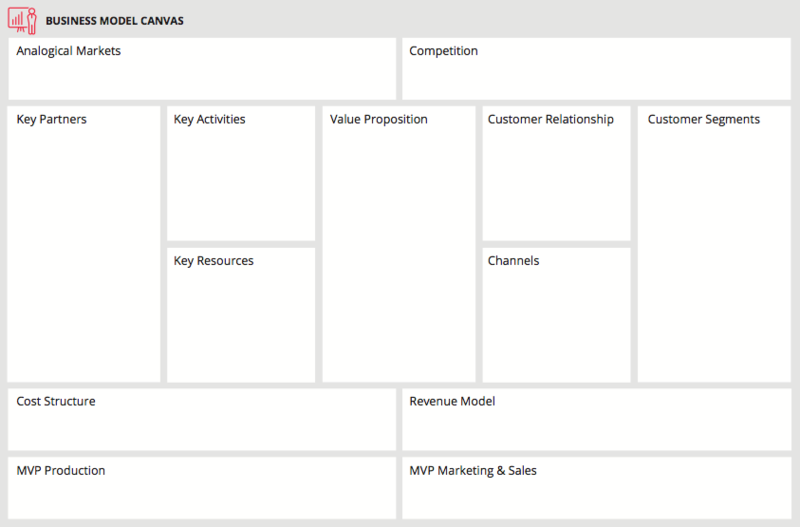 The business model canvas is now available in different versions with different additions. The idea originally came from the Swiss author and lecturer Alexander Osterwalder. The canvas consists of several fields, each of which is a key feature of the business model – a feature without which the business model would not function. For whom do we create added value? Who are our most important customers? These questions help to fill the field “Customer segments”. A business model often focuses on several customer segments, which can be listed here. Different customer segments exist, for example, if the needs, the required offers and sales channels as well as the profitability of the customers differ. How do we reach our customers? How do they want to be reached? How do we sell our products and how do we communicate? Channels can be sales channels, but also marketing channels through which companies make contact with their customers. The design of the customer relationship is crucial in order to win customers and to bind them to the company. The relationship with customers is closely linked to the channels through which the company contacts them. There are many ways to build and develop the relationship with the customer. It can be maintained more personally, for example by direct service in the shop, or more anonymously via the Internet or social networks. The goal of every business model is, of course, to make profit with an idea. There are different possibilities such as the Freemium, the Pay-per-Use or the subscription model. The central aspect of the business model: What (added) value do we offer our customers? This shows the value that distinguishes the product or service and the task it performs for the customer. Every product or service is the result of different resources. What resources are essential for the company to function? These can be materials, but also corresponding capital, personnel or patents. Certain activities are necessary to implement the business model. Which key activities are required to deliver the defined value proposition to the customer segments? Key partners can be strategic partners or the most important suppliers, for example. Here it makes sense to think about which partners carry out key activities for your company and from whom you obtain the most important resources. Costs are incurred in every business model, especially for resources, partners and activities. Where do most costs arise? Which are necessary, which can we minimize? What are the costs in relation to income? The business model canvas is a tool that brings companies from the initial idea to the business model in a structured way. It can support the development, revision and innovation of complex business models by providing an overview of the most important features and bringing them into a scalable system. The business model canvas illustrates the interaction of the various key factors. Entrepreneurs should ask themselves how they can deliver their value proposition to key customers with as few resources and as few costs as possible, and thereby generate the greatest possible profit.